We love the look of an embedded candle. We’ve seen beautiful ones at Pier One and Pottery Barn embedded with flowers, seashells, and cinnamon sticks. These candles make wonderful gifts and they are even more lovely when handmade by you! We love candle making! We met Tommy Yaley at the Craft and Hobby Show. 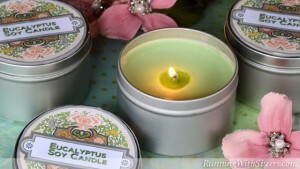 He and his family own and run Yaley Enterprises, makers of all kinds of candle making supplies. When we told Tommy that we wanted to do a course in how to make candles, he helped us so much! He answered all our questions and shared his best tips and tricks. He also shared all kinds of candle making supplies! So as a big thank you to him and Yaley, we made this video showing how to use Yaley’s two-part mold to make an embedded candle. We thought you’d like top see it too. 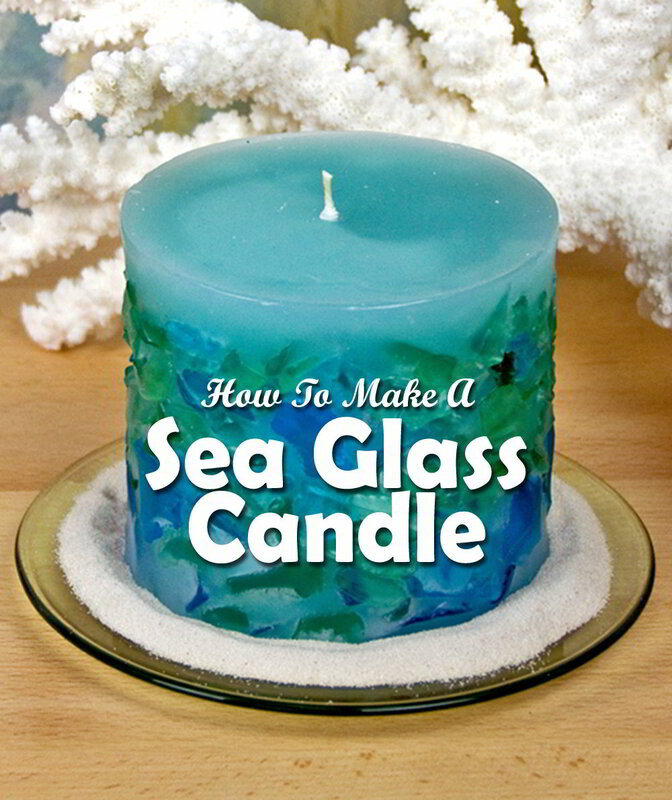 Follow along on the video, then follow the steps below to make your own Sea Glass Candle. If you have any comments or questions, just write them in the comments and we will reply. We are always here to help! 1. 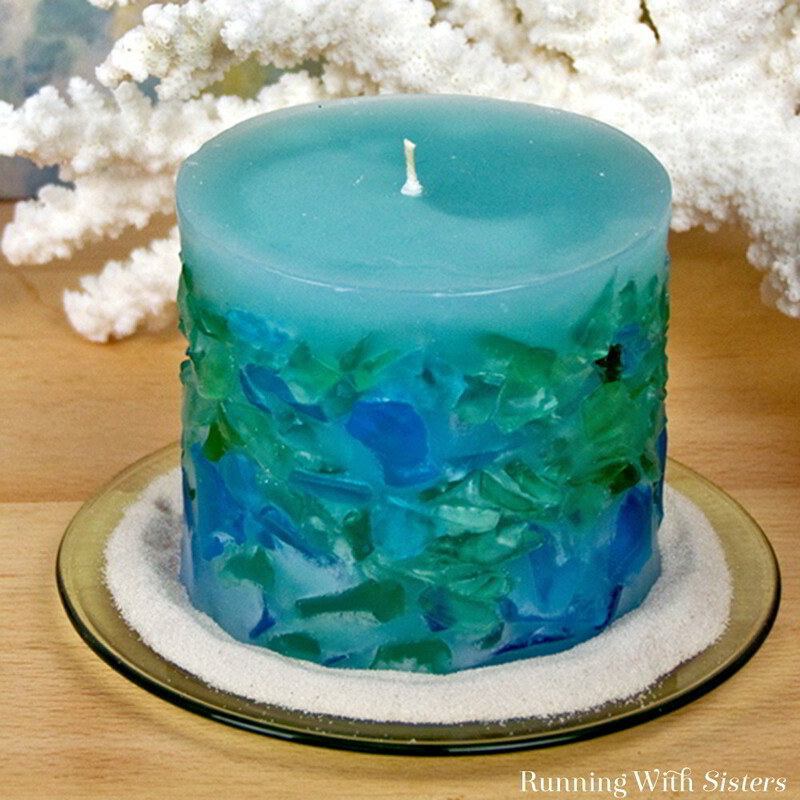 To make the embedded Sea Glass Candle, you will first make a core candle. We like to cover the top edge of the mold (go ahead and do both molds) with small pieces of masking tape. It can be sharp! To wick the inner core mold feed the wicking in through the hole at bottom of the mold. Leave 3 inches of wicking poking out of the bottom of the mold. Seal the bottom of the mold with a coil of mold sealer, tucking the three inches of wicking into the mold sealer clump. 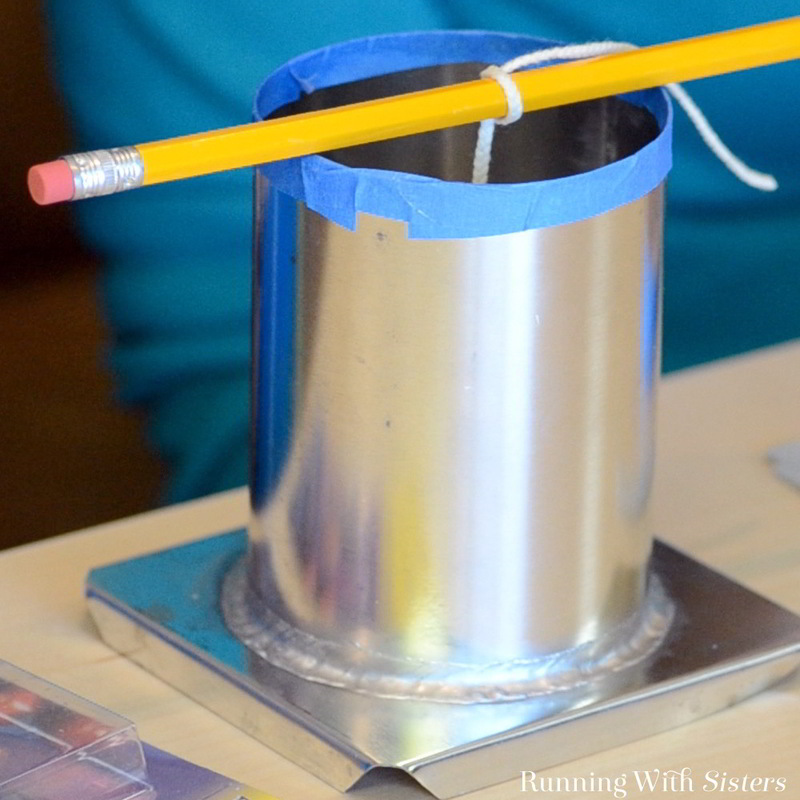 Flip the mold over and tie other end of the wick to a pencil and prop it across the top of the mold. 2. The next step is to melt the pillar wax. Chop the pillar wax into smaller pieces using the hammer and chisel and the cutting board. You will melt enough wax to fill both the outer mold since that’s the size of the finioshed candle. That mold holds 25 ounces of wax. 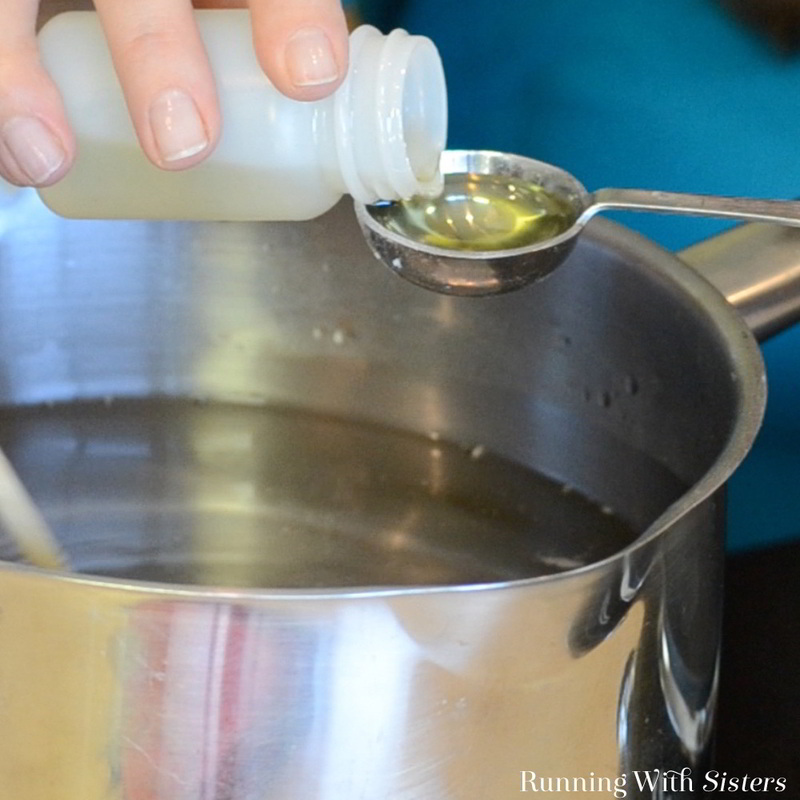 We recommend adding 4 extra ounces to the saucepan for any spills and such. Add one tablespoon of the translucent crystals additive to the wax. This will help keep the wax clear enough to see through it and see the sea glass! Shave a few curls off the candle dye block. Add the curls of color to the melted wax. Stir the color in. 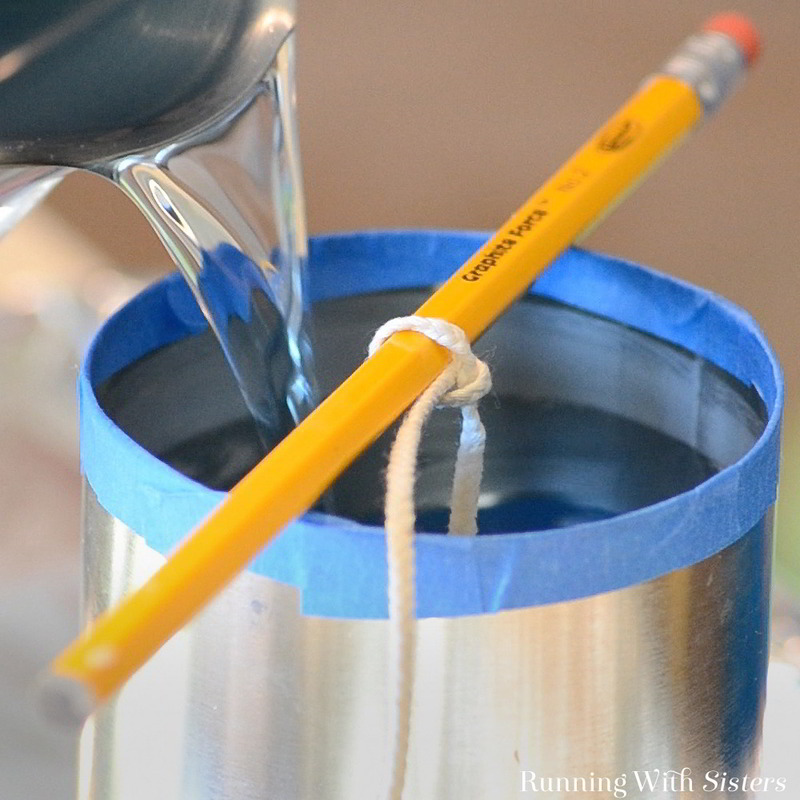 Test the color by dripping the wax onto a white index card. Add more color curls if you like. Stir one tablespoon of candle scent into the melted wax. 3. 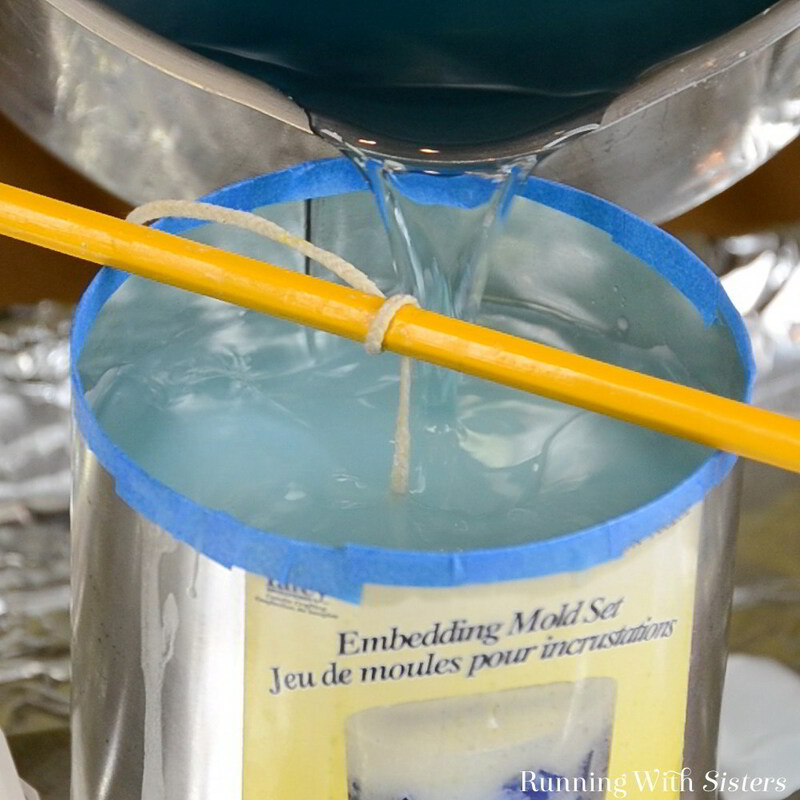 Next, carefully pour the melted wax into the mold. Fill it up to the top, but leave about 3/4” at the top. Let the candle cool for one hour. The candle will shrink as it cools and a divot will form in the top of the candle. Have no fear! This is normal and expected! Poke 4 or 5 holes in the top of the candle with the skewer. Push the skewer all the way to the bottom of the candle. Reheat the wax. Then pour melted wax into the mold to fill the holes and the divot. Do not fill over the original fill line. Let the candle cool. Repeat the poking and refilling if another sinkhole forms. 4. Let the candle cool over night until it is completely cooled and set. 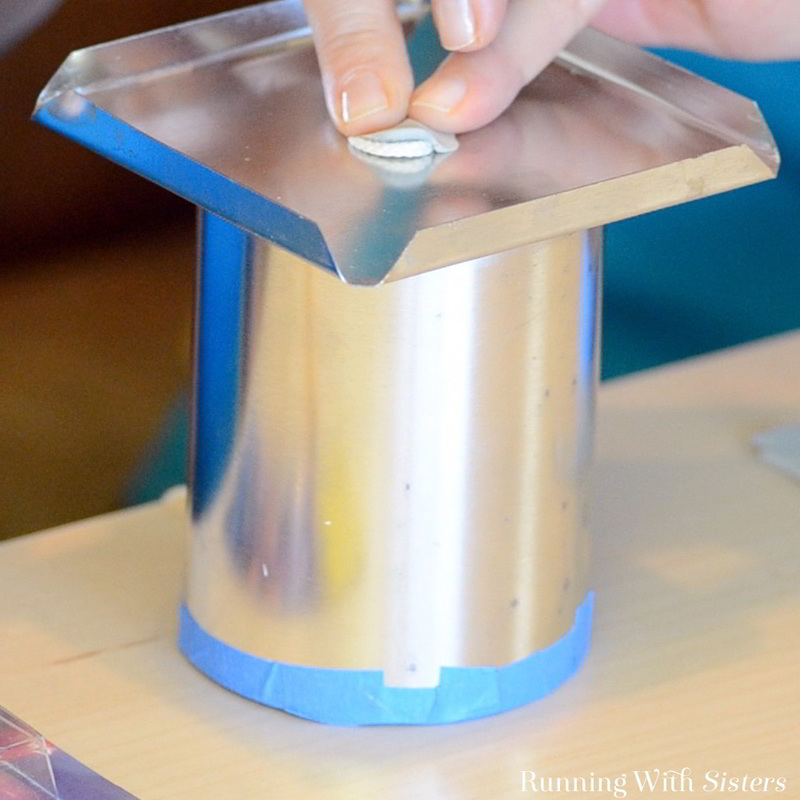 Remove the masking tape from the top edge of the mold. To unmold the candle, untie the wick from the pencil. Turn the mold over keeping your hand over the opening to catch the candle. Peel off the mold sealer. Let the candle slide out of the mold. If it doesn’t come right out, place the mold in the refrigerator for about ten minutes and try again. Trim the top wick that had been tied to the pencil flush. This will be the bottom of the sea glass candle. Turn the candle over – the smooth bottom is now the top! Tada! You have a core candle! Seal the bottom of the outer mold with mold sealer. Place the core candle into the outer mold. Center it. Tie the end of the wick to a pencil. Prop the pencil across the top of the mold. Slide pieces of sea glass into the space between the outer mold and the core candle. 5. Remelt the wax that was left in the saucepan to 210°F. Pour the melted wax into the mold until it covers all the pieces of sea glass and fills the outer mold. Pour enough wax to create a layer over the top of the core candle. Let the candle cool for an hour. The wax will shrink again as it cools. Reheat the wax and pour more wax over the sea glass if any divots form. Repeat as needed while you watch the candle cool. 6. 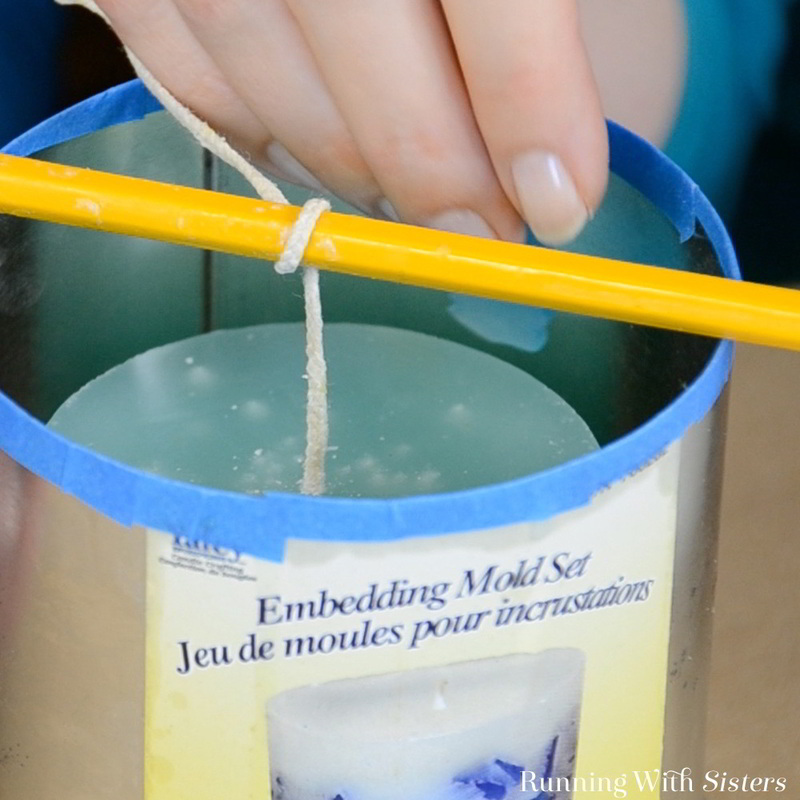 When the candle has cooled, melt the top half-inch of wax in the mold using the heat gun. Let it cool completely overnight. 7. 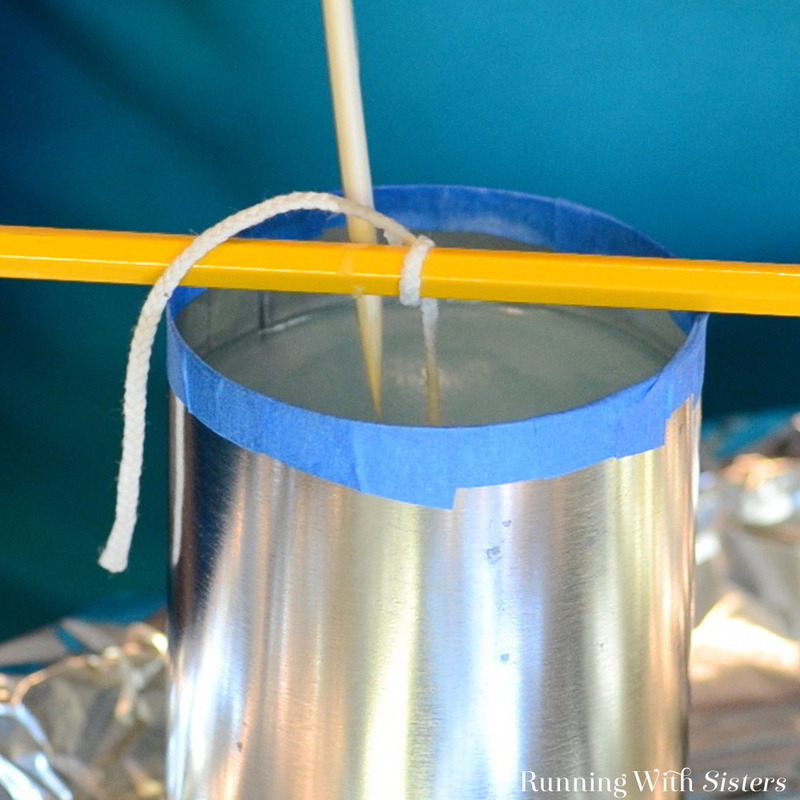 Remove the masking tape from the edge of the mold. Untie the wick from the pencil. Turn the mold over and remove the mold sealer. Let the candle slowly slide out of the mold. (If the candle doesn’t slide out easily, place it in the refrigerator for ten minutes. Try again.) Trim the wick to 1/4 inch. 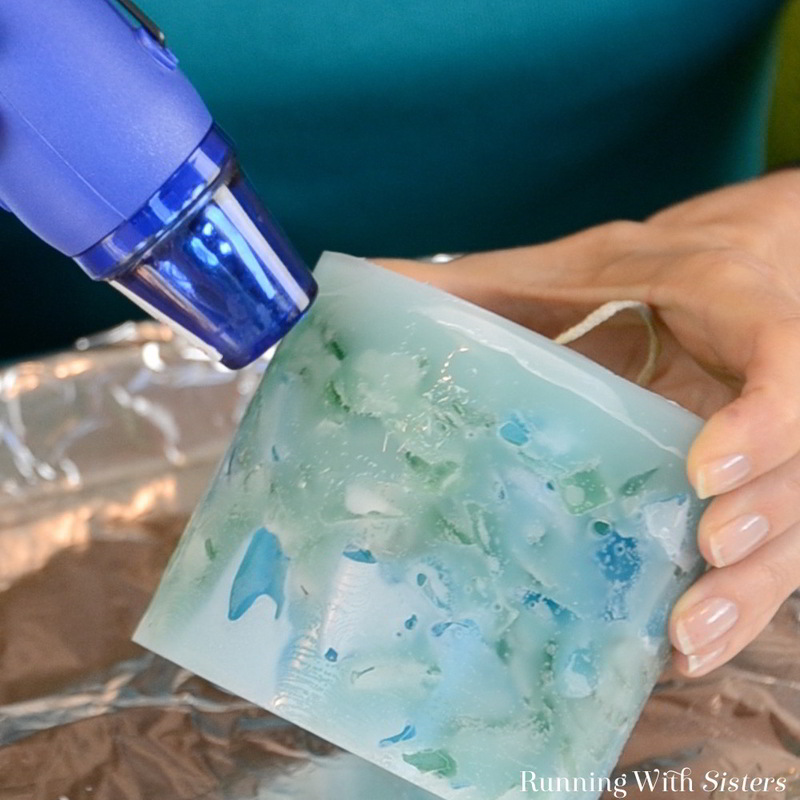 Use the heat gun to melt some wax away from the sides of the candle to reveal some of the sea glass. How pretty is that?! 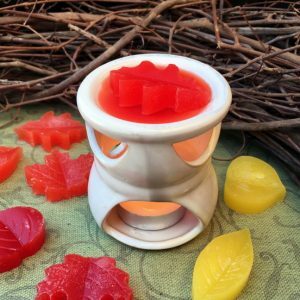 What do you think would look cool embedded in a candle? Leave us a comment. We’d love to hear from you! We have more candle projects! I want to make these for gifts, but can’t find the translucent crystals additive or the 2 part embedding mold! Where did you get yours??? I absolutely loved your sea glass candle, and was planning to buy the ingredients. I started adding up the prices, and it looks like the candle costs $50-$75 to make…is it really that expensive?! Good observation! It depends on how many candles you make. The molds can be reused over and over again. And the liquid candle scent and dye block also will make many, many candles. The mold sealer, the package of wicks, and the translucent crystals additive also will make many candles. 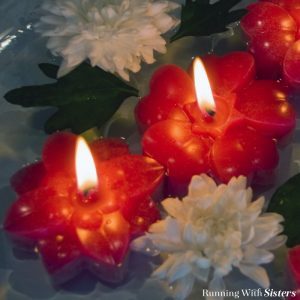 So, yes, if you are getting started in candle making, there is some start-up expenses including the candlemaking thermometer and the heat gun. But the materials cost for each candle goes down as you make more candles. And the one-time cost for this candle is mostly the wax and sea glass. Hope that helps!